So far in this blog, I have focused on children who are over-responsive to sensation (who’s modulator is getting too many messages). These children generally have a low threshold for sensation and avoid or become easily overwhelmed by their environment. This week, I thought I would focus on the ‘sensory seekers’- children who’s ‘modulator’ is asleep. As a parent of a sensory seeking and fun loving 5 year old, despite me having a deeper understanding of sensory issues, I can find myself feeling worn out by her constant curiosity, impulsivity and activity. 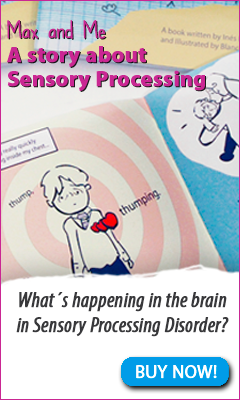 Children at this end of the sensory processing spectrum need more sensory input in order to feel alert and this can also create challenges at school and at home. 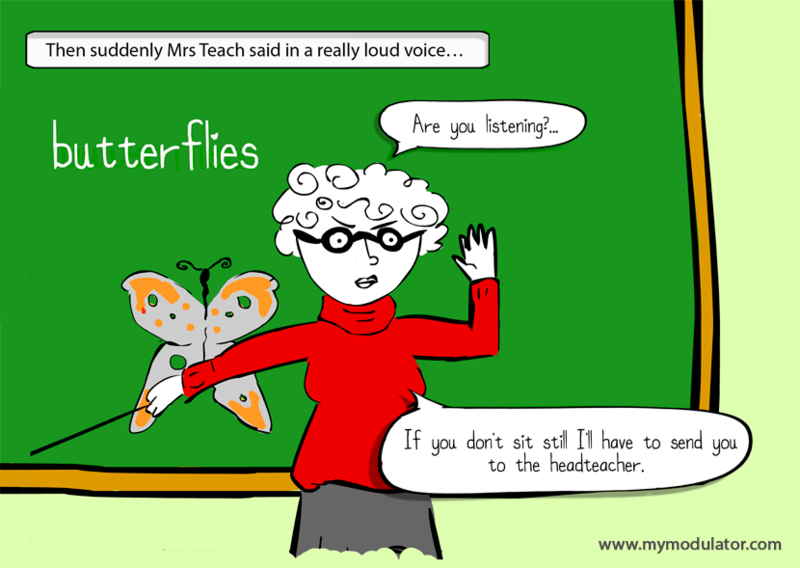 In the book , I have represented this as the child fidgeting/moving in his seat and tapping the pencil on the desk, which gets him into trouble with ‘Mrs Teach’ his teacher. The child’s ‘Modulator’ isn’t getting enough messages to keep him awake, so his body starts to move in order to send more sensory messages to the brain. 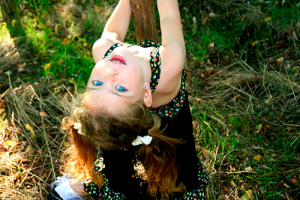 It is very common for children who seek sensation to find sitting still for long periods (like in school) very challenging as they seek out movement in order to feel more alert. Other typical sensory seeking behaviours might be making noise (or seeking out noisy things), feeling/touching things, smelling things, looking around when talking to you/distractable and a need to try out experiences for themselves/impulsive. As a parent some of these behaviours can be challenging at times. For example, I heard myself saying ‘look with your eyes not your hands’ to her as we entered a shop anticipating her need to touch every new and interesting item she sees. Also evening meals can be difficult (when her and her modulator are tired) and she repeatedly swings over the back of then kitchen chair or climbs on the counters to get things. The behaviours of a sensory seeking child overlap with the behaviours commonly seen in ADHD (Attention Deficit Hyperactivity Disorder). Although similar, a recent study found distinct differences. Although the behaviours may be similar, the intervention is different, so talk to your OT or Doctor if you need more information on this. So, what strategies have I adapted to best parent a sensory seeking child? Firstly, we try and incorporate as much movement and exercise into her day. She cycles to school (which helps wake up her modulator), after school we play on the green outside the school or (you’ve guessed it- a trip to the playground!) , or at least I park a little further away so we have a 10-15 minute walk to the car. As she got older (and her sensory needs became more apparent) she has gotten more play equipment for the garden. We have a swing, climbing frame and Santa kindly recently brought a trampoline this year too. On a rainy day, I try and do some dancing, jumping , movement games or yoga at home. I’ve also learned to live with her need to touch/try everything and started to see it as a positive. She has become very independent as a result, has excellent balance and agility due to the constant climbing, loves helping with ‘jobs’ at home and is always willing to try new foods! I have learned not to put things in sight that I don’t want her to touch or let her touch things/smell things with help it so her sensory system is satisfied before I move it out of the way. 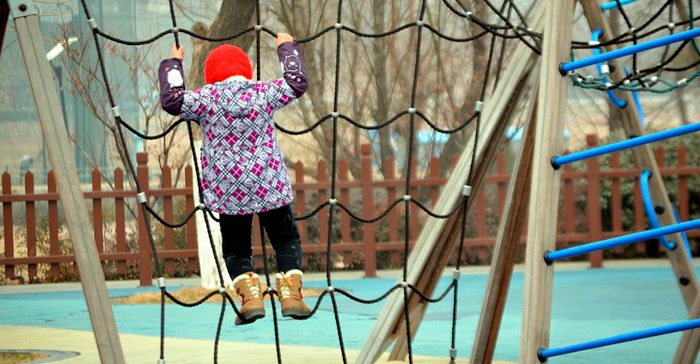 I outline the behaviour I want to see (to all of my kids) before we go to a place for example playground safety – stay in the playground, hold on with both hands etc. and I reward it with praise or a treat at the end if she sticks to the rules. Really importantly I have learned to mind my own ‘modulator’ and look out for times of sensory clashes. When I am tired or hungry, I’ve noticed I become more sensitive to sensation. If this coincides with my daughter (or the other 2) seeking sensation we can clash. So I make sure I have lunch early before the school pick up, try and get to bed early, try and focus on one task at a time (especially in the evening), and take mini sensory breaks throughout the day (e.g. toilet break, take out the rubbish etc). Lastly, I’ve tried an ‘if you can’t beat them join them” approach (like jumping on the trampoline, getting wet in the sea, tickling games, skipping when walking or eating with my hands)- As an adult, we forget how fun movement or getting messy can be . Allowing yourself to fully experience (with all your senses) an activity can be liberating, invigorating and lots of fun and giggles too! Here are a few activity and gift ideas for your sensory seekers. Great article. Really helpful, thank you. It was one of those— when you put it that way, lightbulb moments! 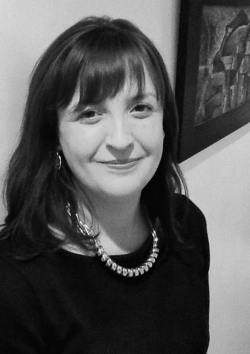 It can be hard to always consider a child’s sensory needs when dealing with their behaviour, but I think having an understanding of how sensory issues influence a child’s behaviour helps parents (me anyway!) to stay calmer and more positive and find practical solutions rather than getting annoyed/frustrated with the child.